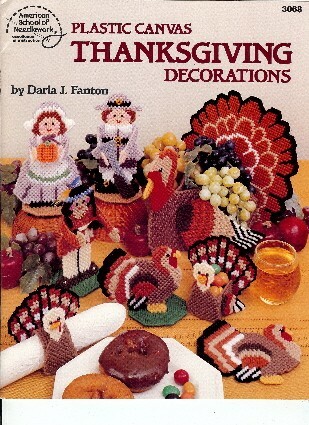 American School of Needlework Plastic Canvas Thanksgiving Decorations plastic canvas pattern booklet. Darla J Fanton. Turkey Coaster, Cornucopia Tissue Box Cover, Turkey Door Decoration, Harvest Pumpkin Door Deocration, Autumn Leaves Wreath, Turkey Basket, Gobble Gobble, Thanksgiving Friends, Indian, Pilgrim Boy, Pilgrim Girl. Appears in like-new to new condition. Name handwritten inside front cover. Out of print.